This episode was based on the short story 'Wasps' Nest', first published in 1928. The story was adapted for television by David Renwick and directed by Brian Farnham. One of Christie's shortest short stories, this had to be embellished quite a lot to work as a 50-minute adaptation. Luckily, Renwick's additions make sense and enhance the story, to some extent. Personally, at least, I've always found it somewhat unbelievable that Poirot would just happen to be passing the chemist's in Barchester, just happen to notice Langton's name (a man he had met once at a dinner party), and then just happen to make the connection that it would have something to do with Harrison and his wife by bumping into Langton in the street. Renwick makes the sensible decision to include a garden fete, which Poirot, Hastings and Japp attend on Hastings's suggestion (of course, it would take Hastings (or Ariadne Oliver, in his later years) for Poirot to attend something like that). 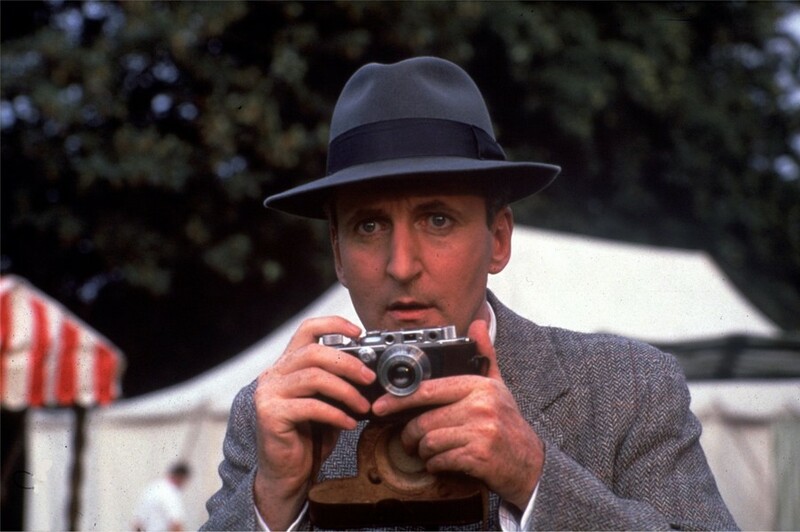 At the garden fete, they meet Harrison and Molly Deane, and Hastings takes photos of Langton, Harrison and Deane (his new hobby). Harrison becomes a long-time friend of Poirot here, or rather, Poirot was a friend of his father, who was one of his first friends in England. Poirot, for fun it seems, reads the tea leaves of Molly Deane and notices the bright red lipstick on the cup (belonging to Langton, who is cleverly dressed up as a clown on the fete). Later, Poirot gets stung by one of the wasps in Harrison's garden and has to go to the local chemist (where he discovers Langdon's name in the poison registry). Moreover, Japp (who is added to the story) is admitted to hospital with appendicitis, in an amusing subplot that leads to Japp identifying the doctor of Harrison. Miss Lemon is added, and she regularly attends fitness classes in the same street that Harrison visits his doctor (providing Poirot with yet another link). Also, Molly Deane becomes a fashion model in the adaptation, thus allowing for an extravagant fashion show that also provides a clue to the crime (it turns out Langton has a photo of Deane in a new season's dress; proof of their affair). Another clue added to the mix is a large amount of petrol in the water tank outside Harrison's house (Poirot notices the smell), proof that Harrison substituted the petrol with water to ensure that Langton wouldn't succeed with the wasp killing and would resort to cyanide. Finally, Poirot is seen breaking into Langton's house (!) to remove the cyanide and replace it with washing soda, so that Harrison wouldn't succeed (which is much more believable than just placing some soda in his jacket pocket). In the end, then, the adaptation adds a long list of clues which Poirot has to piece together. Consequently, this becomes an quintessential Poirot episode, since he arrives at the right conclusion through his excellent observational skills and his knowledge of human psychology. The episode is also one of the darker ones of the series up to this point. Farnham's direction is well executed. He displays the all-important wasps' nest from all possible angles, and nicely displays the London suburb summer, as well as the fashion show. Locationwise, a house near Shepperton becomes Harrison's house, Arnos Grove station becomes 'Marble Hill Station', an Art Deco house in Surrey (seen briefly in The Veiled Lady) becomes Langton's house, and Japp ends up at the Royal Masonic Hospital in Ravenscroft Park. See this website for location photos. The soundtrack is great for this one, and 'The Height of Fashion' (Molly Deane's theme) is available on the latest CD. By this point in the series I really feel that Suchet's Poirot has settled. By now, Poirot looks and sounds exactly the same as in the most recent episodes. It's a testament to Suchet's skill, that so little has changed. As he tends to note when interviewed about the series, Poirot never really changed in Christie's descriptions, and neither should his portrayal of him. Of the guest actors, the standouts are Martin Turner as John Harrison and a young Peter Capaldi as Claude Langton, but the entire cast works well for this episode. Why do you say "it would take Hastings or Mrs. Oliver" to make Poirot attend a garden fete? I don't think Poirot is portrayed as anti-social, a la Holmes? Surely Hastings was Poirot's first friend in this country. Or at least someone in the village of St Mary. Such a nice episode. Two things come to my mind. The first is the perfect directing near the end, when Poirot goes to Harrison's house. It's a one single shot scene, capturing the landscape. The second is the OST for this episode, it's a copy from David Shire's score from The Conversation (1974), a Coppola's psychological thriller. Check it out and compare both tracks. It's the last track of the álbum, Ensemble Version (2:31). This is a fabulous adaptation, funny at the right times (watch Suchet/Poirot's reaction when Hastings takes the photo at the fashion show! ), both faithful to the book and yet superbly embellished, and movingly performed. It also passes the acid test: read the original story as soon as you can after watching, and see if the TV characterisations fit AC's descriptions. Martin Turner as Harrison is absolutely pitch perfect. I would also highlight the scene where Poirot returns to Harrison's house, to find the latter slumped in his chair, unmoving. This is a chilling and memorable moment in the story, and director Farnham captures it beautifully. And, finally, the music is pulled back, and allows the production to breathe. It contributes to the atmosphere instead of hijacking it. A wonderful adaptation of one of AC's most haunting stories. Hi there. In case you are interested: the fashion show takes place in the Freemasons' Hall in London. This is one of the episodes where we see Poirot get angry, although it's at Miss Lemon and Hastings and essentially provoked by boredom. Nice blogs thank you for this insight. Hi, I really love this blog and keep coming back to it for reviews and little bits of information. I have a question, does anyone know what piece of music is playing in the background during the fashion show, roughly in the middle of the episode (26 minutes into it or thereabouts)? I've picked up some nice 1920's-30's music from the series through the years and would like to know what that one is... Thanks!